Our Colorado Avalanche season-in-review series continues with the second installment examining goaltender Semyon Varlamov. 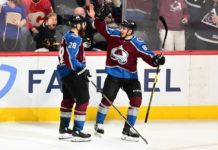 The 30-year-old completed his seventh season with the Avs and had an impressive bounce-back year following offseason surgeries on a few lingering injuries. Going into the season, it was made known to the Avalanche fan base that the goal was for Varlamov to play around 50 games this season as a precautionary measure in hopes of protecting him from being overworked during his season-long rehabilitation. Ironically and unfortunately, Varlamov ended up getting injured for the remainder of the season in his 51st game of the year. In those 51 games, Varlamov had a 2.68 goals-against average and a .920 save percentage ranking as one of his better seasons in an Avalanche sweater in those categories. The constant carousel of Avalanche defenseman — many of which were borderline NHLers — was yet another obstacle Varlamov had to overcome this season. The thrown-together group of defensemen, combined with Varlamov’s constant battle with injury and recuperation from surgeries led to a less than ideal win percentage for Colorado when Varlamov was in net. The Avalanche were 24-16-6 with Varlamov between the pipes, good for a 47 percent winning percentage. As a comparison, the 2013-14 season in which he was a Vezina Trophy finalist, the team won 67 percent of the time Varlamov was in net. As was consistent in all aspects of the team, Varlamov’s home and road splits vastly differ. At home, Varlamov went 15-6-2 with 2.28 goals-against and a .933 save percentage, while on the road he had a 9-10-4 record with a 3.09 goals-against and a .906 save percentage. Varlamov’s surgeries looked to have done wonders for Varlamov’s movement and his confidence in his own body’s ability to accomplish what he wanted it to. His movement looked as fiery and snappy as ever and he displayed his confidence in his ability to move laterally quickly by challenging shots a bit more than we are used to seeing. The addition of goaltending coach Jussi Parkkila to the Avalanche coaching staff helped Varlamov’s game, as Parkkila is very detail-oriented, helping Varlamov in small, but important areas of his game. Many of Parkkila and Varlamov’s practice drills together dealt with the plays from behind the goal line and movement while in the reverse-VH, and those were certainly some of Varlamov’s strengths this season. Traditionally, Varlamov is known for allowing really bad goals on occasion, which can be summarized by former coach Patrick Roy once infamously saying, “Come on, Varly. This can’t happen.” Well this season, Varlamov kept the “this can’t happen” moments to a minimum. 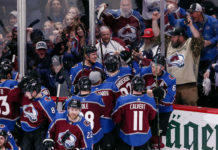 One that particularly comes to mind was in overtime against Filip Forsberg of the Nashville Predators where it looked like Varlamov wasn’t expecting a shot, but a pass across ice and Forsberg ended up shooting, freezing Varlamov for the game-winner during a crucial stretch of games for the Avs. On the other side of the spectrum, there were several instances where Colorado was getting outshot and outplayed but were still well in the game due to their number-one goaltender’s play. Throughout the season, Varlamov was able to put the team on his shoulders and steal a few games, as well as make the big save that his teammates turned into confidence to help them win games. 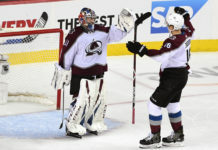 As the Avalanche surpassed expectations and achieved more than many pundits thought they would, Varlamov followed suit. 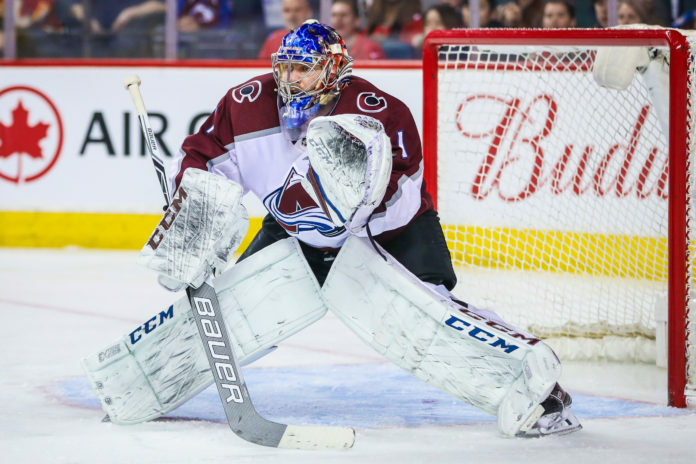 A year in which his comeback from injury would be the focus and his playing time would be limited, the Avs’ starting goaltender proved that his best years are not behind him and he still adds a lot of value as the starter. There were several windows throughout the season in which Varlamov missed time due to injury, and his reliability remains a concern, which knocks his season grade down a few points. While he meets the minimum expectation of a .920 save percentage on the year, he did so by the hairs of his chin and much like the entire team, Varlamov’s production on the road has to improve. Luckily, the injury he suffered that fateful March evening in Chicago was not going to be a long-term injury and it wasn’t to any of the areas where he has had a history of getting hurt, so Colorado should expect to have a fully healthy Varlamov. Whether fully-healthy means 100 percent is certainly where the question lies as there will always be concern about Varlamov’s durability. The Avalanche have acquired Czech goaltender Pavel Francouz already this offseason in hopes to ensure the backup role in Colorado is occupied by a capable goalie. While the Avalanche continue to move forward with a group that is youthful and inexperienced, having a strong, reliable person in net will be critical to any future playoff hopes. Varlamov has been and will continue to be the strong goaltender the Avalanche need at least for one more season. Now a full year removed from surgery and an entire offseason of training, Varlamov should be ready to start the season healthier than we have seen him in a long time. The circumstances in which he left the season should have him as eager as we’ve ever seen as well.